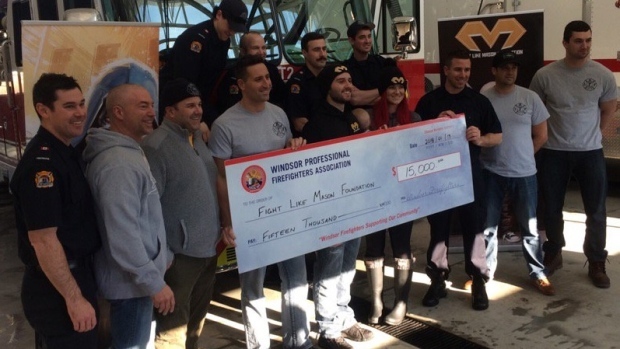 Windsor firefighters have come through in a big way for the Fight Like Mason Foundation. On Friday morning, the firefighters association presented a cheque for $15,000 to the foundation. That is the money raised from the sale of the 2018 firefighters calendar, which included a superhero theme in honour of Mason Macri. The four-year-old boy, who loved superheroes and firefighters, passed away from cancer in June 2016. The chairperson of the calendar committee, Dan Sementilli, says they are proud to make this significant contribution. This is the first time the Windsor fire departments' calendar had a theme, and Sementilli says it’s also the first time sponsors paid for the entire expense of printing 1,500 calendars. So every dollar raised will go to the Fight Like Mason Foundation. The money will go towards childhood cancer research, and also help pay for new superhero IV poles for children at local hospitals. “Getting a cheque like this, almost brings a tear to my eye that people really believe in what we're trying to do,” adds Macri.